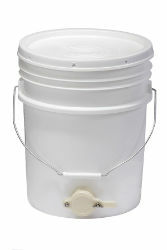 This 5-gallon bucket comes with a tightly fitting lid and honey gate. Place it under your extractor to collect honey. It can also be used to bring simple syrup to your hives and refill feeders early in the season.